NEWS FLASH: This download is now free! Things are changing at ARTK12. I guess things always change. Along with books and bingo cards ARTK12 will now begin selling PDF downloads. 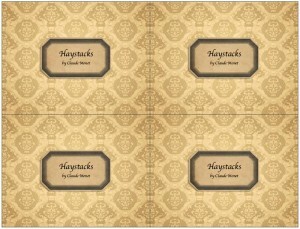 The first PDF we’re selling is a matching game based on our new online game: Monet’s Haystacks. In 1890-1891 Monet produced a series of about 25 paintings of haystacks. He used these canvases to show how a single subject could change depending upon the time of day, the weather, and the season of the year. 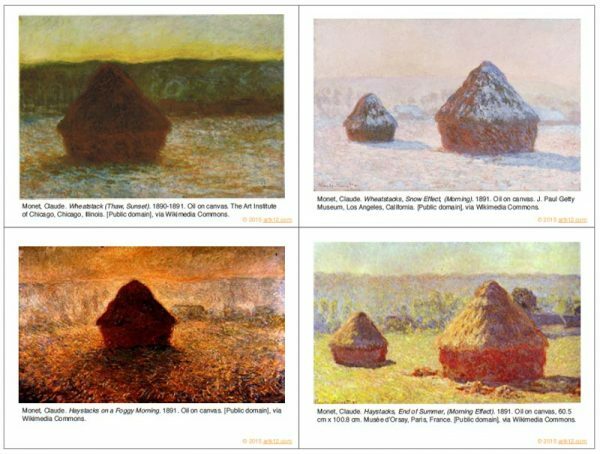 This new download consists of 12 Monet Haystacks for the card fronts and a nice neutral card back. After printing the cards on 8.5 x 11 inch card stock you can print (back-to-back) then cut them into pieces. You can laminate them to help them last longer. The game is played by shuffling the cards and putting them all face down. Flip one card over and then try to find the matching card by flipping another one over. If they match, leave them facing up, if they don’t turn them over and try again. The game can be played alone or with two people. Two people keep score by seeing who gets the most matches. As with all our art games the end game is get your students looking at great art and having fun at the same time. The game cost $1.49 and you’ll have access to the download immediately after payment.